Bring Your Family and Friends for Fun, Adventure and Relaxation at Rose Bay Water Sports! Located at the Hidden Treasure Tiki Bar & Grill in Port Orange, Rose Bay Water Sports is a vacation destination where you can enjoy great food and sweeping panoramic views of the bay. Rose Bay Water Sports rents Kayaks, Stand Up Paddle Boards (SUPs), Canoes, Pedal Boats, Mouse Jet Boats, and the Bat-Mobile Boat! Hot Florida days mean water fun for everyone! Check out our gallery of guests keeping cool on Rose Bay! See Why Guests Love It! Birthday Party? Bachelor/Bachelorette Party? 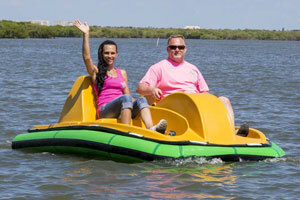 Make it unique with a private water sports party! ""It was a very relaxing breezy ride on the paddle boats with my two sons. The prices were very reasonably set for an hour session. Gave us enough time to build up an appetite to stay for lunch as well. I'd give this facility a 5/5 star rating.""